Appraisals: What are they and Why do you need them? 1) What is their purpose? A home appraisal determines the professional opinion of a property’s true market value, whether it’s a house, condominium or vacant land. 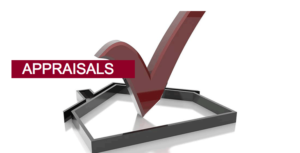 Typically, appraisals are used to assist in the decision making process of purchasing, selling or refinancing a home. 2) Why are they important to have? An appraisal helps a seller list their home for a fair price. If the value is too low, the home may sell quickly but might not retrieve the highest dollar amount possible. Alternatively, if the price is too high the home could stay on the market for months. An appraisal is just as important for buyers who need to know that the value of the home they want to purchase matches the price tag. For homeowners looking to refinance their home, an appraisal determines the amount of funds that can be withdrawn from the property. 3) What do they mean for a bank or mortgage lender? A bank or mortgage lender assesses attributes of a property such as neighbourhood, remaining economic life and value. An appraisal will determine how much money a bank or mortgage lender will lend someone for a mortgage. Appraisals are being more commonly used as the real estate itself is the collateral for the mortgage being provided. If the value of the appraisal is lower than the purchase price offered, the buyer is responsible for making up the difference between them. 4) What is the difference between an appraisal and a home inspection? As we mentioned before, a home appraisal determines the professional opinion of a property’s true market value. A home inspection gives you the current condition and economic life of the different parts of the home you’re considering. This helps you understand the current overall condition of the house so that you know of any upcoming maintenance or repairs you may need to consider. 5) Who owns the appraisal and why? Prepared using the guidelines of the specific bank or lender, the appraisal report is considered to be the property of the bank or lender. Even if a homeowner pays for an appraisal, the lender is still considered to be the appraiser’s client and has control over whether the appraisal is shared with the homeowner or not. 6) How is value estimated? Based on the current price of materials, the cost approach estimates what the cost to reproduce a new building identical to the subject property would be. The appraiser then subtracts any accumulated depreciation due to wear and tear and adds land value. The income approach determines the value of an income producing property based on the income generated. Typically, this is calculated by dividing the net operating income of the rent (gross revenue minus all operating expenses) by the capitalization rate. This approach compares similar properties that have sold and/or active listings. The appraiser will take comparable properties that have recently sold and consider adjustments for differences. The variations in the comparable properties will have a value determined by the appraiser based on market evidence. Example: If the property being appraised has 4 bedrooms, and a comparable property has only 3 bedrooms, an adjustment for the amount of value the extra bedroom is worth would be added to the property being appraised. We hope this helps explain why an appraisal is important in the home buying process. If you have any questions, please don’t hesitate to contact any of our qualified brokers. Found a home that is almost perfect you, if only the kitchen was updated or the bathroom had new fixtures? Now you can update the house in your price range to make it the home of your dreams with the purchase plus improvements program. By allowing you to add the cost of your renovations to your mortgage, your dream home is closer than you think.